Sneezeguard Solutions ® sneeze guard Storecarts are designed for use with our Folding Portable Sneeze guards that are set up and torn down on a frequent basis. The Storecart is able to hold and transport 9 sneeze guards at a time to help make set-ups and tear downs more efficient. The Storecart has 5″ diameter non-marking wheels that roll easily across various surfaces for ease of transport. The Storecart can also be extended in height to accommodate Hi-Profile sneeze guards through the addition of the Storecart Expander Kit. For facilities that need more storage capacity the Storecart can be combined into a Double-Deck version that can hold and transport 18 sneeze guards at a time through the use of a Union Kit. Durable- retains its usefulness through durable construction. 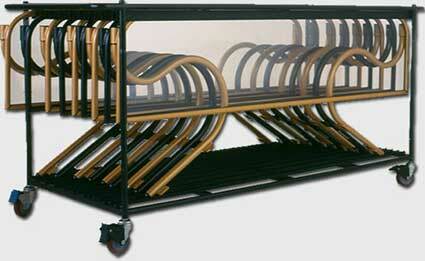 Labor Saving- Allows server to transport and set up as many as 18 guards with the use of a Storecart Union Kit. Storecart height without caster kit is 31.75″ inches overall.